If you follow a vegetarian diet plan, or if you are planning to follow one, ensure that you are eating a variety of food. This will supply your body with all the required minerals and nutrients. A healthy vegetarian diet should include grains, fruits, green vegetables, pulses, nuts and seeds, beans and also a small amount of fat. Dairy products are also important but if you are following a vegan diet, nutrition has to be supplemented with food like soy milk, tofu and so on. If you like to adopt a healthy vegetarian diet, you cannot just scrap off the meat from your menu and have everything else that remains. You will have to make an effort to have extra food that can fill the nutrition void that is left behind. But if you can manage to eat all the right foods, the vegetarian diet benefits will keep you extremely healthy and fit, since it contains much less fat and cholesterol and also has more fiber. A healthy vegetarian diet should include a lot of meat alternatives like a nut loves, soy burgers, textured vegetables, tofu dogs and so on. These products will stimulate the taste and nutrient content of meat and at the same time, will decrease the calorie and fat intake in your body. Here are some of the alternatives that you can choose. If you are following a vegan diet, nutrition of cow milk can be got from alternative drinks like rice milk, almond milk, soymilk and so on. In place of butter, you can make use of olive oil, water, vegetable broth, wine and similar products. You can also use soy cheese and nutritional yeast flakes in place of cheese. 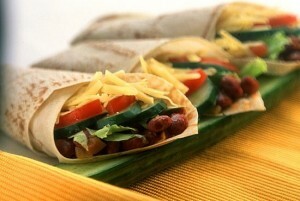 If you are following a vegetarian diet plan with no eggs, you can try commercial egg replacers. These are usually potato starch. You can also use mixed tofu to make an egg-free omelet. Women need about 45 grams per day and men need around 55 grams. Since one cup of tofu contains about 20 grams of protein, you do not really have much to worry about your protein intake. If you are a vegan, include high protein vegan foods like nuts, brown rice, tofu, soy and lentils. However, if you are a lacto-ovo vegetarian, you will probably get all your protein from your daily diet and you have nothing to worry about. The best vegetarian diet should also include a lot of calcium, as both women and children require a lot of calcium. Other than milk, there are a number of alternative food that you can include in your healthy vegetarian diet for nutrition. You can try spinach, kale, soy milk, fortified orange juice, sesame seeds, tahini broccoli, almonds, carrots, and rice milk. As a vegetarian, you can sometimes have more iron in your body than people who follow a non-vegetarian diet. However, if you still take iron supplements, you can wash it down with some orange juice, as Vitamin C increases the absorption of iron. Finally, the good news is that even if you a vegetarian athlete, you can get adequate amount of nutrition from your diet. However, make sure that you have a balanced diet that covers all the requirements of your body. I came across your website while searching for bodybuilding blogs on google and thought id link to you hope you dont mind just wanted to share the love.